I’ve written several times about the development of a client-server Interactive Fiction platform. Parts of this system are called FyreVM, Zifmia, and other parts are just plain old web application development. FyreVM was created years ago and is a very stable implementation of the Glulx virtual machine. Zifmia is a state-machine wrapper that allows FyreVM games to run on a web server with all of the commands coming through AJAX calls and output returned as JSON. 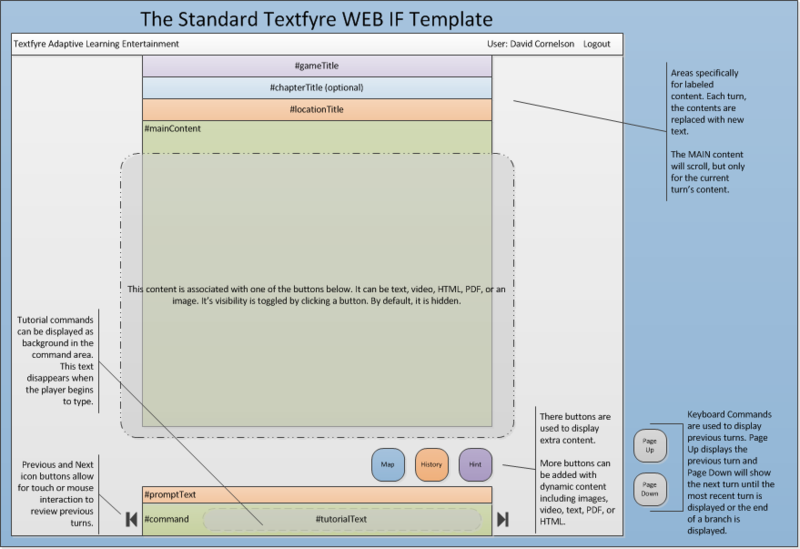 I wanted to provide a more detailed view of the new Textfyre system’s construction. I spent a good portion of my spare time last summer working through the technical issues of a client-server implementation of FyreVM/Glulx. I’d had a very rough prototype, but last summer I sanded down the rough edges and came away with something solid. There were still major issues to resolve, including the design and persistence, but eventually I was able to send commands into the server-side engine and receive story data and display it on a web page. The next step was to turn it all into something “enterprise” ready. Something that initially could handle hundreds of users, but also be able to scale. An additional benefit to using RESTful web services for all game play is that other types of clients can be developed later (iPad, Android, Windows 8 Metro). One of the primary differences in this approach is that all of the game data is stored on the Textfyre servers. You might call it Cloud-IF since the player could conceivably play the same game from many computers and devices without any concern for saving, restoring, or managing files. The system stores the results of every turn and provides a user-interface that lets the player “jump” to any historical turn. The user interface even tracks branches, so the player can see where they jumped and where they changes paths. This is done using Eloquera, an object-oriented database. It allows for very simple storage and retrieval of session data. Not to stress this too much, but designing a modern user interface for Interactive Fiction is very difficult. Juhana Leinonen set the standard with his Vorple demonstration a year ago at PAX East. Jon Ingold and his partner Joseph Humfrey are doing some amazing things at Inkle Studios (Note: Jon Ingold is the co-designer and writer of Textfyre’s The Shadow in the Cathedral). I’d like Textfyre’s offering to be capable of similar results. With that in mind, I’ve left all of the styling capability of this system to external resources. I considered adding a bunch of CSS capability to an Inform 7 extension and asking the author to work under those constraints. After a few passes, this was simply tiresome and very much the wrong direction. I designed the IO of FyreVM to be design neutral for a reason. I believe firmly that content should not know about how it is formatted; outside of emphasizing text with boldface, italics, or similar in-line styles. Any placement or styling beyond that should be handled by the content type. Since FyreVM allows the author to channel output to different content types, this is easily handled in the “interpreter”. In this case, the browser is our interpreter. We simply take content types and associate them to browser placement and styling. The next assumption I made was that whatever template I designed was only going to be the default or standard template. There are a set of guidelines for authors or anyone interest to develop their own template. It may be daunting for an author and certainly a non-programmer to develop a template using HTML5, but it’s certainly not impossible or even improbable. I think the results of Vorple and Inkle Studios is confirmation that the IF world has the talent. The standard template is very similar to a standard desktop interpreter with a few changes. Images can be identified by the game by filename and embedded in-game play, a map can be identified, and a few other visual elements allow interaction with the game, including displaying the player’s current inventory. It would not be difficult to modify the standard template to move things around. Swapping in a new CSS file could change the entire design, similar to the way CSS Zen Garden works. Prompt This is the text that precedes the prompt. In a standard IF game, this has always been “>”, but in our system, it can be any normal text. Main This is the main text of the game, which includes any ‘before’ text, the location title and description, any object lists, and ‘after’ text. Time This is the time of day within the game. It’s not always implemented or used, so the standard template looks at the Settings text to see if it should be displayed or not. Location This is the location name. Chapter If a game implements chapter titles, this is that text. Credits This is the list of credits for the game. Hints This is the current list of hints for the game. This data has to coordinate with the browser properly, so modifications to the standard template are required. Score This contains the current score, if one is offered. The Settings text will identify if a score is displayed or not. Title This is the game title. Prologue This is the text displayed in the ‘When play begins’ rule of the game. Turn This is the current turn number. Tips This is a tip for the player. Version This is version of the game. Verb This contains the verb in the last command. Tutorial This contains tutorial text. Maps This contains a map image filename or some other text to show a map to the user. The standard template uses images (that change throughout the game). Dead This is the text emitted when the game has ended. Settings This text contains information on whether other types of text should be displayed or not. Authors can dynamically label alternative content, which can in turn be displayed in the browser based on author preferences. 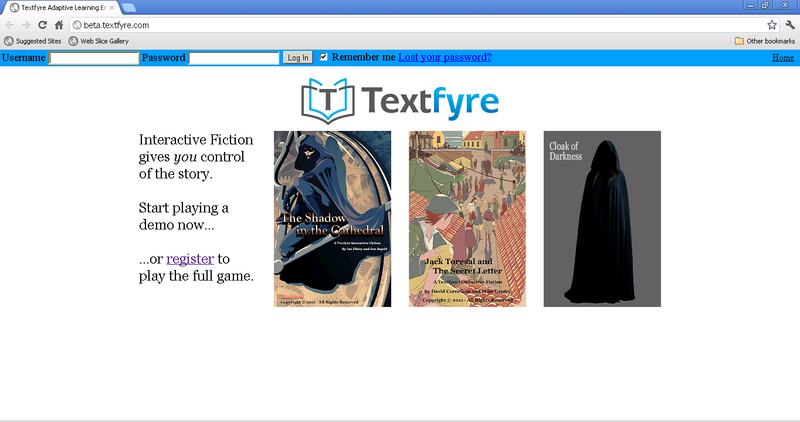 The new Textfyre website is nearly completed and in coordination with several eReader publications, is due out soon. It’s taken a long time to work through all of the technical details, but I think the results will be very attractive to Interactive Fiction game players as well as authors, teachers, and educational content providers. Overheard on ifMUD last week was an observation-only comment about Zifmia being vaporware. I was amused by the comment, since I have made great progress on the entire project in the last few months. I just haven’t been talking about it all that much. Since there has been no demonstration of Zifmia and no public discussion, the vaporware comment was accurate. However, that is all about to change. I have a working system and although I’m slightly side-tracked with a potential investor meeting on the 16th, a beta of Zifmia is coming this month. The beta will be a replacement of the entire Textfyre.com website into a game portal for Interactive Fiction developed with Inform 7, FyreVM and Zifmia extensions, images, js, css, and html. A version of Cloak of Darkness will be present in the beta along with a demo version of Shadow in the Cathedral. A full version of Shadow will be added when the payment system is ready. Other features will be added over time, including the ability to upload your own games and web provisioning. I intend the beta of the new Textfyre website to be an extended period of time, to let the kinks iron out. One of the first tasks will be to adapt extensions for the “standard” Zifmia design, which will be very simple. You can see a functional sample of the latest standard design at http://textfyre.com/design/zifmia-design-2.html. The opening page is a templated “prologue” and following a press of any key, the main template is displayed. Currently there is a column of main text, some spot art, fly out text windows on the left and right, a command line text box, along with map and hint buttons. Templates are based on straight HTML5/CSS3 using jQuery and various jQuery plugins. I’ve tested this design with IE9, FF 5, and Chrome. It does not work on mobile devices as I see that as a separate template entirely. I plan to investigate jQuery Mobile to help with that work. I plan to move forward with this design and implement an Inform 7 extension to implement the various pieces. It shouldn’t be too hard to create simple Inform 7 markup that translates to html with known classes. Feel free to test it out and leave comments.